Mossèn Costa i Llobera Gardens, Barcelona, Spain. March, 2017.
today I'm back with a new post and a new, unusual, location. I'm still in Barcelona eheheh, in a place I've discovered by chance on Instagram...It's just in front of the port, on the Montjuic mountain and a few minutes from the city center. 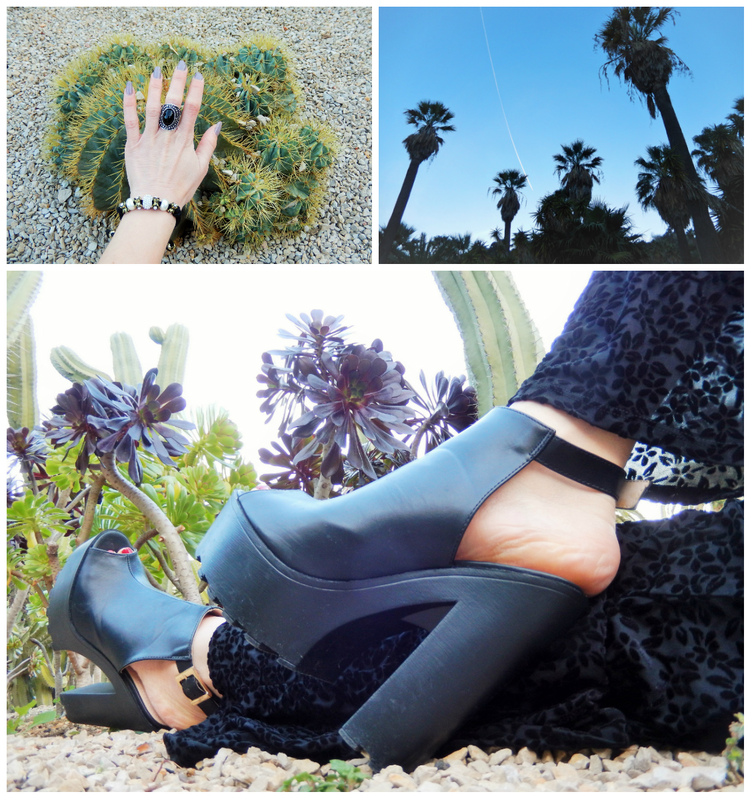 I chose these gardens as backdrop for my outfit 'cause I like the contrast between clothes I wear and the wild surrounding nature, moreover desert and its vegetation are perfectly in tone with my mood and feelings. As I previously wrote, I felt lost in many occasions, as someone who's trying to find the right way but this way looks so faraway and hard to reach. Cactus and similar plants represent all bad moments I lived and heartstrings I felt....Only my fortitude, perseverance and positive attitude, together with faith, helped me to turn my life around and start again, stronger than before. I think that in these moments we need someone we love, especially family, and believe in something....Routine take up too much time, we don't give the right space to care our emotional and spiritual life, that are essential aspects of life. I'm still working on it...What do you think about? I'd like to know your opinion!!! oggi sono di nuovo qui con un post dall'insolita location. Sono sempre a Barcellona,eheheh, in un luogo che ho scoperto per caso su Instagram e che mi ha subito colpita. Si trova esattamente sulla montagna del Montjuic, orientato verso il mare e a pochi passi dal centro della città. Ho scelto questi giardini come scenario per il mio outfit perchè mi ispirava il contrasto tra l'abbigliamento elegante che indosso e la natura arida circostante. Inoltre il deserto e la vegetazione che lo caratterizza sono perfettamente in sintonia con il mio umore e sentimenti. Come ho scritto in precedenza mi sono sentita persa, in varie occasioni, come una persona in cerca della propria strada, una strada che sembra troppo lontana e impossibile da raggiungere. I catus infatti rappresentano per me tutti i brutti momenti vissuti...Solo la forza, la perseveranza e l'ottimismo, insieme alla fede, mi hanno aiutata a dare una svolta alla mia vita e a ricominciare con una marcia in più. Credo che in tali momenti abbiamo bisogno di persone che amiamo e di credere in qualcosa...La routine ci ruba troppo tempo, ci distrae e non ci permette di dedicare il giusto spazio alla cura della nostra parte emotiva e spirituale, che a mio parere sono essenziali. Cosa ne pensate a riguardo? Fatemi sapere. Me chiflan las fotos, estas muy muy guapa. Muchas gracias Soraya!! !Un beso grande desde Barcelona!!! Kisses and enjoy the weekend!!! Thanks,so glad you like it!!! Oh yes, it was very unusual for being in Barcelona...I liked it so much!!! Quella jumpsuit ti sta da urlo! You are seriously beautiful and I absolutely love your style. Totally relate with what you are saying about the cacti being a metaphor for harder times and making you stronger. What a special person you are, I can totally tell! Thanks Kelly, you're so nice!!! In life we've to go through bad times for achieving that we desire...I don't like the comfort zone....I prefer the storm eheheh!! !Hugs from Barcelona! Stunning photos! Love your coat! You're absolutely right!!! The most important thing is to know ourselves and to still work on it...Living with harmony is the key to reach happiness or at least serenity!!! Very interesting location, perfect for you OOTD. I like your furry jacket. Thanks Mercy!!! !I like creating a good atmosphere and a match between my outfit & the backdrop!!! favolosa questa location e tu bellissima! Lovely post! I think you're right about emotion and spiritualism being essential aspects of life that we don't dedicate enough time to. Thanks Georgia,I'm glad you're agree with me....I'm still working on it but I'm happy to have again discovered this aspect of my life!!! Barcelona seems FANTASTIC! Also, I am in love with this black and white ensemble. I definitely love the single braid with this look. Very chic and sophisticated. Great style as always lady! I'm so obsessed with the style of your black jumpsuit and how you styled it what that cream faux fur coat! I am not ready to put my faux furs away just yet! Thanks Rina!! !Said by you it's very pleasant 'cause I really like your style!!! What a perfect outfit! I love the edgy 70s vibes! Thanks Aria!! !I love it too...it's elegant but in a cute way, a bit fancy too, as the backdrop!!! You're too nice, dear!! !So glad you like my look!!! I love the location and your outfit makes it even better. The jumpsuit and fur coat are so dreamy. Thank you so much!! !Wish you an amazing day and week!!! Grazie Amrita!! !Diciamo che da Barcellona non te lo aspetti eheheh!!! bellissime foto :-) le tute jumpsuit nere sono sempre eleganti e molto femminili. Grazie Emma!! !Mi piacciono molto le tute, specialmente in colore nero o bordeaux, le trovo perfette per uscire la sera!! !Un abbraccio e buon weekend! Thank you so much Emma!! !Have a nice day!